Get announcements of new topics and important updates to existing topics from the Town of Davidson in your RSS reader or emailed to you as a daily digest. Subscribe to updates from the Town of Davidson, and you'll get emails announcing new topics and the outcome of existing topics. The building contains three distinct spaces -- classrooms & offices, a large open room (formerly the cafeteria), and a historic auditorium -- each of which can be put to a variety of uses. During Phase I of the Steering Committee’s work, they seek your input regarding how these spaces can be used in a way that maximizes the building’s value to the community. Please complete this short survey. Please help us name our new park. More details are available at this link. Should the Davidson Board of Commissioners be allowed to vote remotely during a meeting? The board of commissioners would like to amend the rules of procedure to allow voting by remote participation, if there is a physical quorum present at the meeting, and have the vote count. They requested that a question be added to Open Town Hall to gather public input. They will likely consider a vote on a potential change in rules of procedure on October 23. Please give us your input by clicking the link. What are your expectations of the Davidson Fire Department? The Davidson Fire Department will begin the early stages of the accreditation process sponsored by the Commission on Fire Accreditation International (CFAI). This self-evaluation process will allow the Davidson Fire Department to look at all areas of the organization with an eye toward improvement. They need public input. Could you please take their short survey to rank Davidson Fire Department services? How should the Town of Davidson proceed with $300,00 in state grant money? You've responded to our questions via this portal in the past; please consider answering this one. Please click the link. Please share your thoughts on the proposed public facilities project. The Davidson Board of Commissioners have listed public facilities as a priority in their 2018-2019 Strategic Plan. The provision of adequate space for employees to serve the citizens of Davidson into the future is a fundamental aspect of the services provided by the Town of Davidson. After several years of planning for improvements to our public facilities, including a space needs assessment, the town has been setting aside funds for the past three years to address our public facilities needs. The Davidson Board of Commissioners would like to hear from more citizens on this topic. Could you please take our very short survey? At the May 8 meeting, the Davidson Board of Commissioners approved a revised 2018 meeting schedule. This new schedule reflects the cancellation of the Davidson Coffee Chat on May 21 because we have outgrown the space at The Egg at Davidson. The Davidson Board of Commissioners values time with citizens to interact without an agenda. The new meeting schedule reflects the following: The first Tuesday of the month will be a work session at 6:00 p.m. with an agenda, starting June 5. Starting in August, we will transition to the following schedule: Meet on the first Tuesday of the month at 6:00 p.m. for a work session with an agenda Meet on the second Tuesday of the month at 6:00 p.m. for a work session with an agenda Meet on the fourth Tuesday of the month at 6:00 p.m. for a regular meeting with an agenda (includes a public comment period) The mayor and commissioners are available for one-on-one meetings with citizens. Please arrange these meetings with them individually. We'd like to get your input on coffee chats and the overall schedule. Could you please complete our survey? 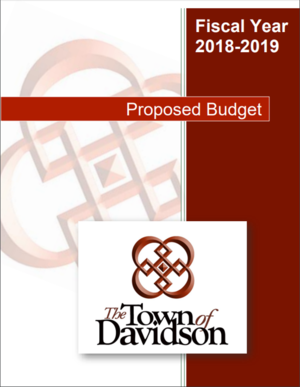 On April 24 at the Davidson Board of Commissioners meeting, Town Manager Jamie Justice and Finance Director Piet Swart initiated the budget approval process by presenting the proposed budget for fiscal year 2018-2019 (July 1, 2018 – June 30, 2019). The board of commissioners will discuss the budget at meetings on May 1, 8, and 22, and will consider approval at the June 12 meeting. Citizens are invited to engage during the public hearing scheduled for May 8 at 6:00 p.m. (held at Davidson United Methodist Church located at 233 South Main Street) and during the public comment periods associated with the specific budget agenda items on May May 1, May 22, and June 12 (held at Davidson Town Hall in the board room). Have you reviewed the proposed budget for FY 2018-2019? Do you approve of the proposed budget for FY 2018-2019? Please list in order the priorities on which you believe the Town of Davidson should focus for FY 2018-2019. The Davidson Mayor and Board of Commissioners have discussed changes to the Town of Davidson’s vision statement and core value #5 over the past few months. After some discussion, they recommend a new vision and core value #5. Please take our short survey -- we want to hear from you! The ReadDavidson committee requests that readers vote on the book selection for the spring 2018 ReadDavidson program. ReadDavidson, an annual town-wide reading initiative that started in 2007, is a partnership between the Town of Davidson, the Davidson Public Library, Main Street Books, and several local avid readers. The ReadDavidson committee encourages people to read a selected book and attend fun and educational book-related events that make the book come to life. To cast your vote and read more click here. How do you feel about the Davidson Police Department? The Davidson Police Department is committed to professionalism, ethics, accountability, and teamwork. As part of the CALEA (Commission on Accreditation for Law Enforcement Agencies, Inc.) reaccreditation process, the Davidson Police Department seeks feedback from our citizens. Please consider taking this short survey to help the Davidson Police Department better serve you. Which book should we select for ReadDavidson 2017? ReadDavidson is a town-wide initiative organized by a group of avid readers, Main Street Books, the Davidson Public Library, and the Town of Davidson. Since 2007, books have been chosen annually, and related events have been planned to make each book come to life. Our ReadDavidson program season will coincide with the town’s April is for Arts celebration in 2017. Please take a brief moment and weigh in on which book we should select.